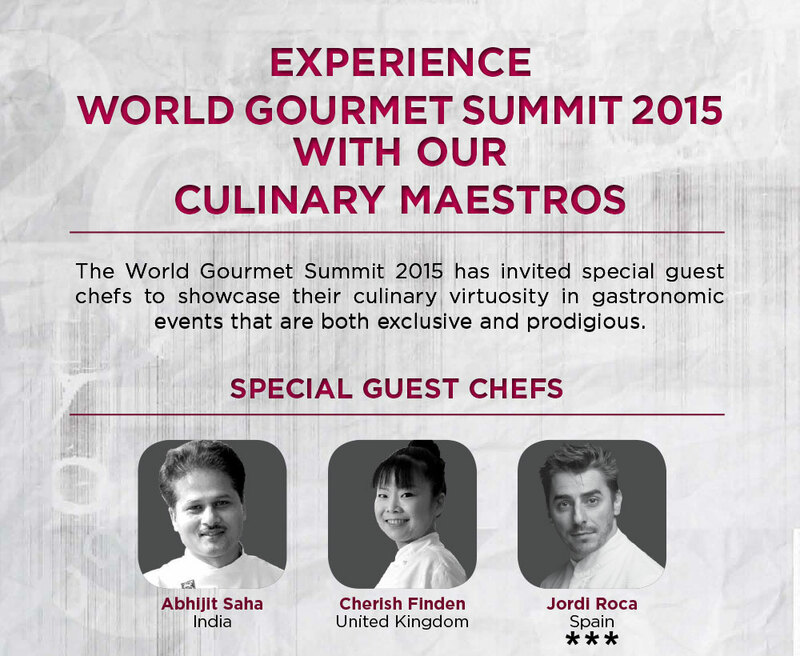 Singapore’s annual World Gourmet Summit is, without doubt, one of the premier culinary events on the global calendar. This year, it was my happy privilege to have Saha Signature Indian Restaurant & Terrace Bar participate in this culinary extravaganza. 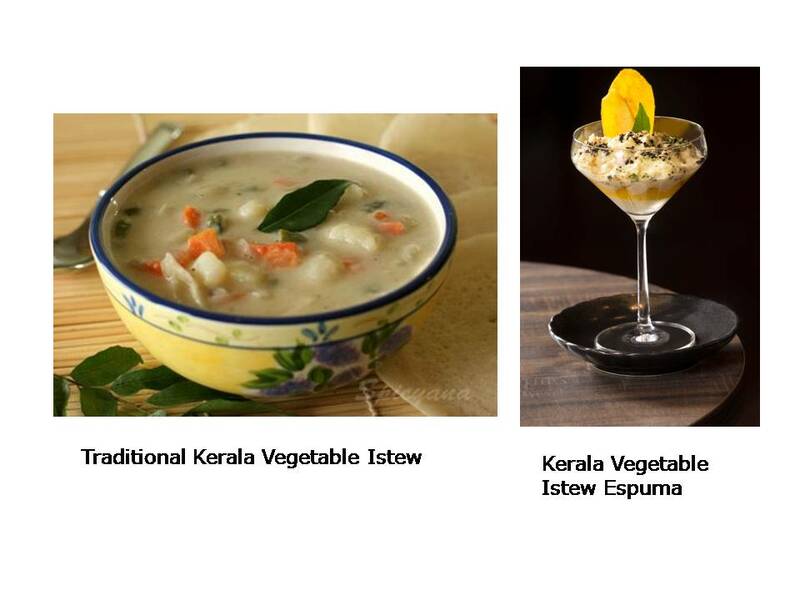 Saha was among the Singapore restaurants that showcased the expertise of master chefs from the world over in a series of superb culinary experiences during the World Gourmet Summit from April 6 to May 3. It allowed me the opportunity to meet some amazing chefs and other food professionals, sit down to standout gourmet meals, conduct and attend master classes and also to present what we do at Saha to a wider audience. 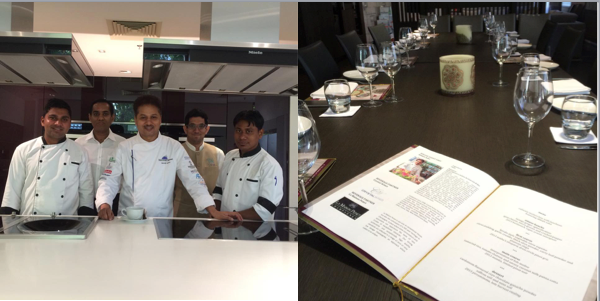 The theme for WGS 2015 was ‘Gastronomy in Motion’ and at Saha we created gourmet menus that reflect this concept. 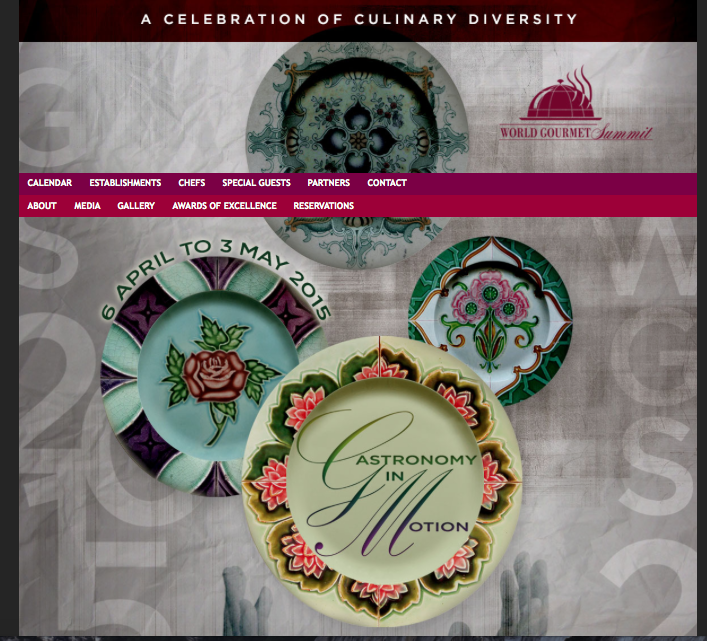 The very basis of avant-garde cuisine is to move and move forward, making it a perfect fit with this year’s theme. 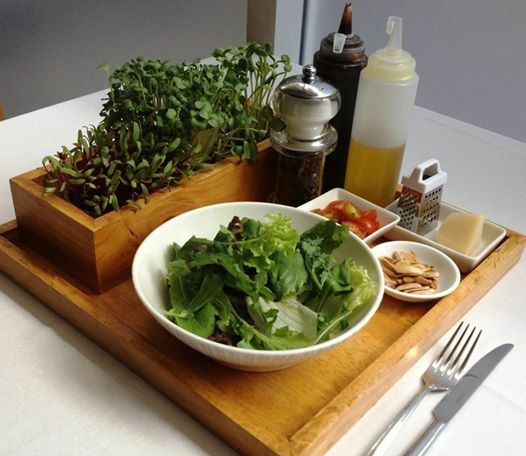 While there were culinary adventures to be had everywhere, we pulled out something extra special for our guests at Saha. 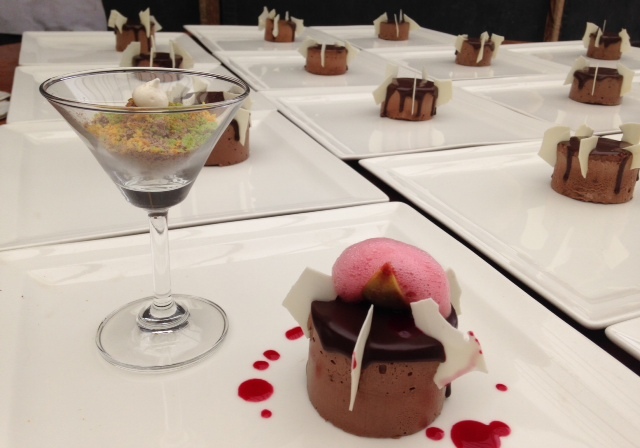 I used the opportunity to create 30 new dishes for the Epicurean Delight and Degustation. Inspired creations included such new age creations as Deconstructed cucumber raita; Textures of lamb comprising pistachio crusted chop, shikampuri kebab and haleem; Kaffir lime flavoured tandoori salmon; Tribute Singapore – a vegetarian creation of stir-fried baby kalian, tofu and water chestnuts, seasoned with cumin, chilli and garlic, Parmesan cheese kulfi with Mango Sorbet and Phirni Lyte. While we launched the WGS Special menus at Saha on April 6, the events started on April 13 and one of the highlights at Saha was a sparkling Networking Evening on the day, attended by some 50 guests, including celebrity chefs, prominent members of the F&B community, food writers, bloggers and members of the press. We were happy to host Chef Peter Knipp, Principal Creator & Organizer of WGS with his elegant wife Sue Bee, Dr Kwan Lui, Founder of At-Sunrice Global Chefs Academy, Singapore, Master Riesling Wine Maker Dr Lippold, Chef Niklesh Sharma from Malaysia, Master Kaiseki Chef Shinichiro Takagi from Japan Two Michelin Star Chef Giancarlo Perbellini, from Verona and Executive Pastry Chef Cherish Finden from London, amongst others. 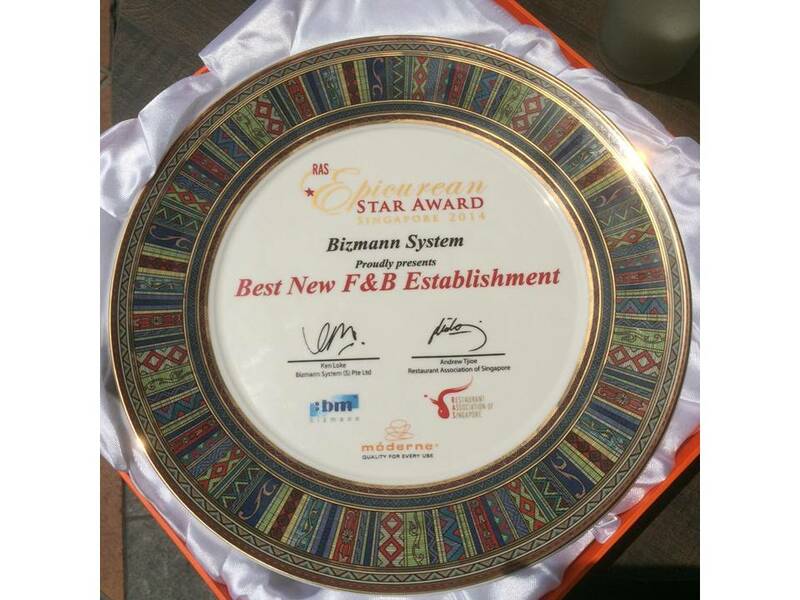 The Awards of Excellence and the Opening Reception where the stars of the culinary world were present was held on April 14 at the swank One Farrer Hotel. While Chef Ivan Brehm of Bacchanalia stole the show by winning 3 awards including Chef of the Year, we celebrated, too, the nomination of our Resident Sous Chef Preetam Sodi for the Young Chef of the Year award. The other highlight of the evening was the spectacular display of over 20 Chocolate & Sugar showpieces by Chef Niklesh Sharma and his team. 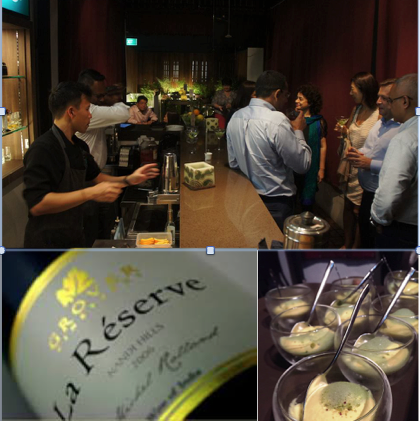 The signature event at Saha held on April 29 was an evening of Indian Tapas & Grover Wines. 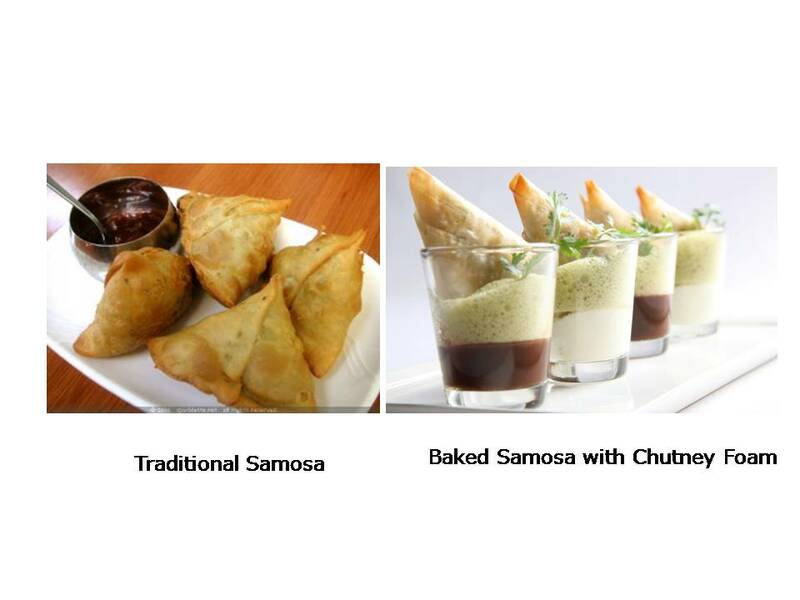 We intended it to be an informal and fun evening where guests could mingle while sipping on Grover wine cocktails and nibbling on a series of innovative Indian tapas, small plates and petit desserts. Guests also appreciated my live demo of Fresh Smoked Oysters with Kachumber & Aloo Papri Chaat Modern which was an eye-opener for many about the possibilities of Indian cuisine. 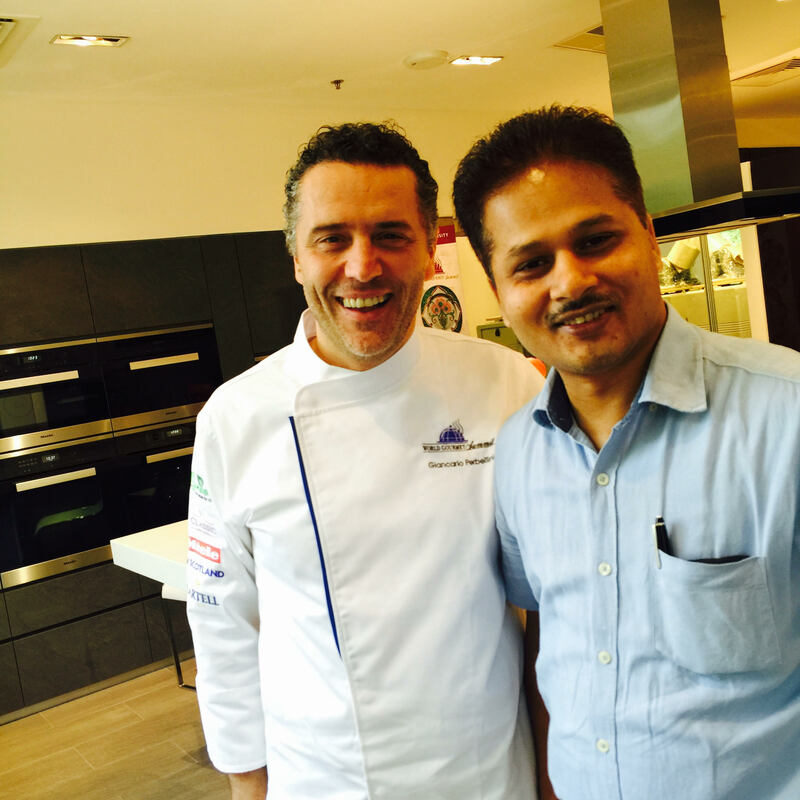 While the WGS was an endless whirl of culinary activity, I seized the opportunity to experience some world class meals and attend sessions by other renowned chefs on many occasions with Kripal Amanna, Editor & Publisher of Food Lovers Magazine (official media partner from India for WGS 2015). A wonderful experience was the WGS Epicurean Delight Dinner by 2 Michelin Star Chef Tim Raue at Skirt at the W Hotel in Sentosa. His menu included such delights as Carpaccio of Scallop, Elderflower Dressing & Green Melon, Steamed Turbot with Leek & Ginger; Peking duck dimsum, cucumber & spring onion and banana, yuzu & smoked butter. The Rougie foie gras dinner at Forlino, created by Chef Chris Salans from Mosaic Restaurant, Bali, was another memorable experience of WGS 2015. 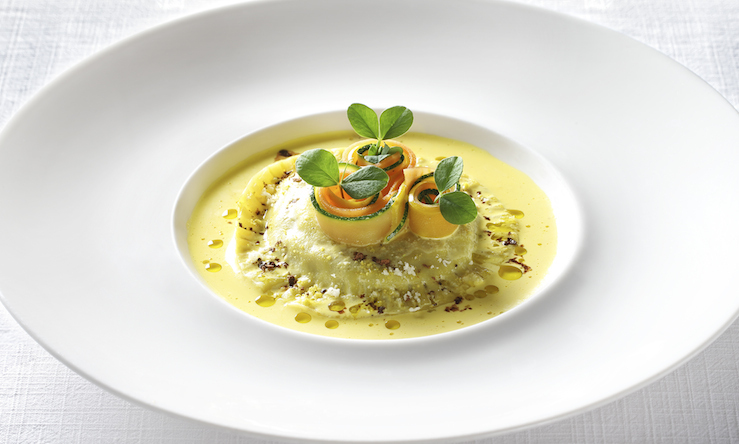 I marveled at the way this chef redefined this luxury ingredient. 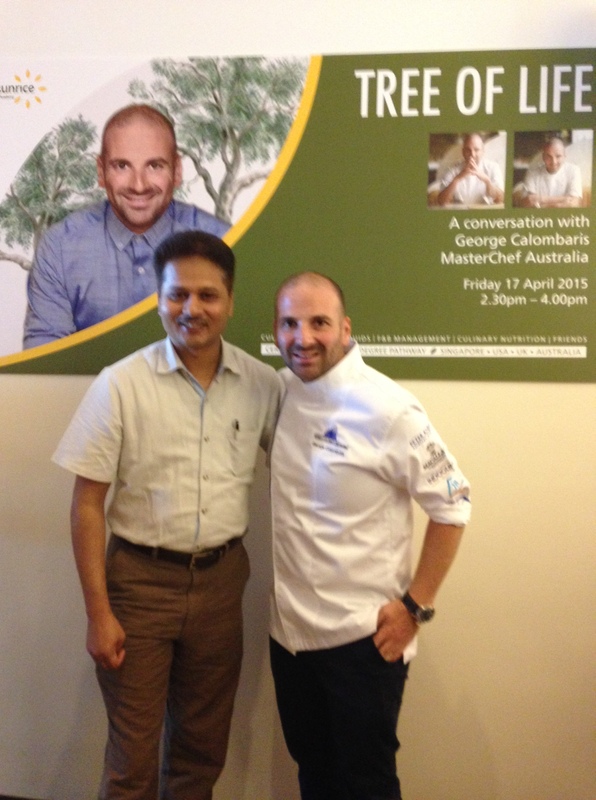 I also enjoyed reconnecting with Masterchef Australia host George Calombaris at a special event held in At-Sunrice Global Chefs Academy. 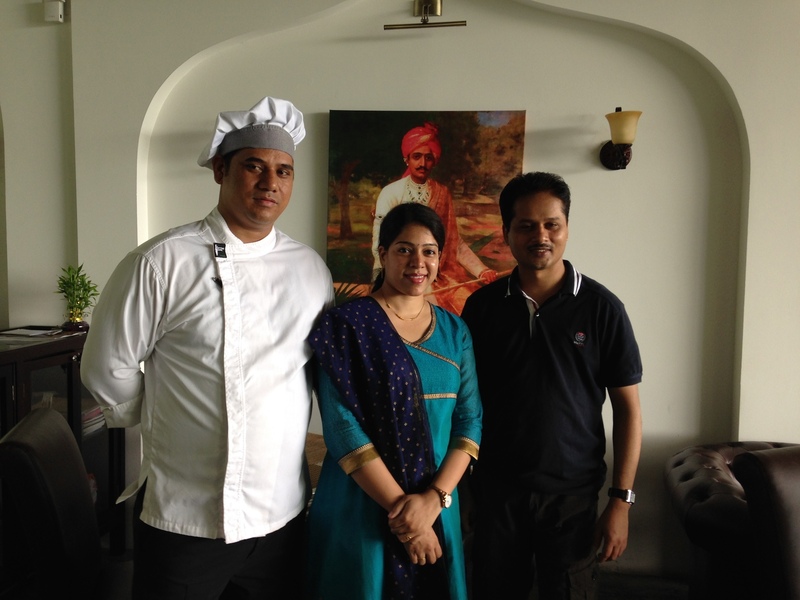 We fondly recollected the time we spent together in Bangalore when I hosted him and Chef Gary at special events at Caperberry & Fava in 2013. The opportunity to interact with Chef Jordi Roca & Master Sommelier Josep Roca of the famed El Celler de Can Roca at The Macallan Master of Taste after party in Bacchanalia was another unforgettable experience. 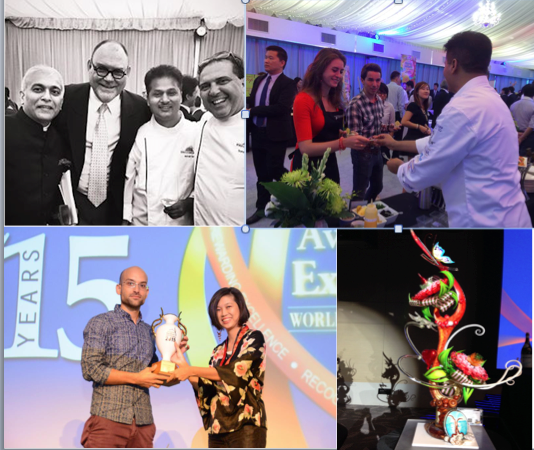 WGS 2015 was a splendid show and kudos to Chef Peter Knipp and his team for organizing this spectacular showcase of gastronomy for the past 19 years and raising the bar every time. I am thrilled that Saha was part of this prestigious event. 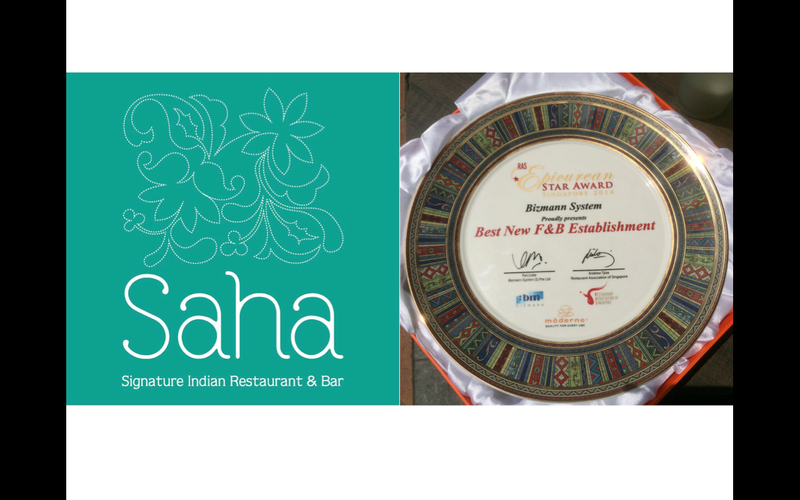 The accolades from our VIP guests, celebrity chefs and, of course, our customers at Saha was the best thing about it, assuring us that avant garde Indian cuisine is now ready to take on the world. 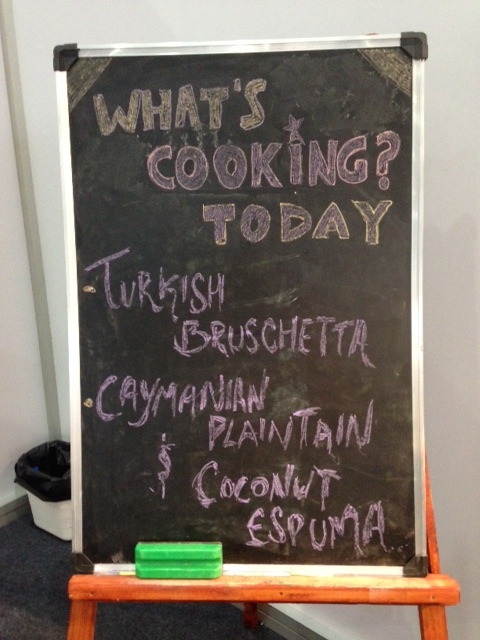 An IT business exhibition may seem like an unlikely place for a chef to be. 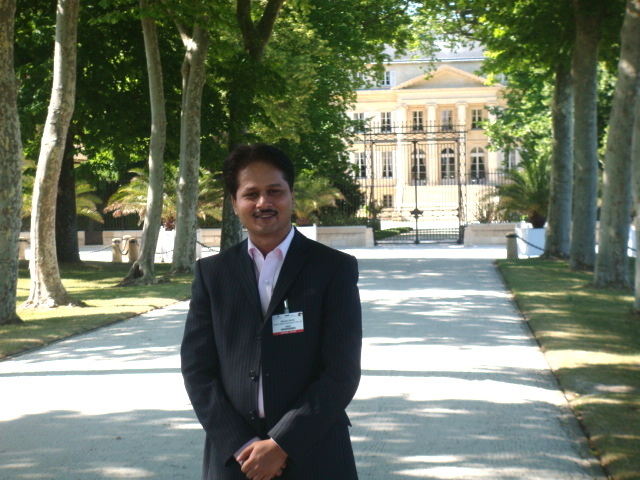 But there I was at CeBIT 2014, held from November 12-14 in Bangalore. 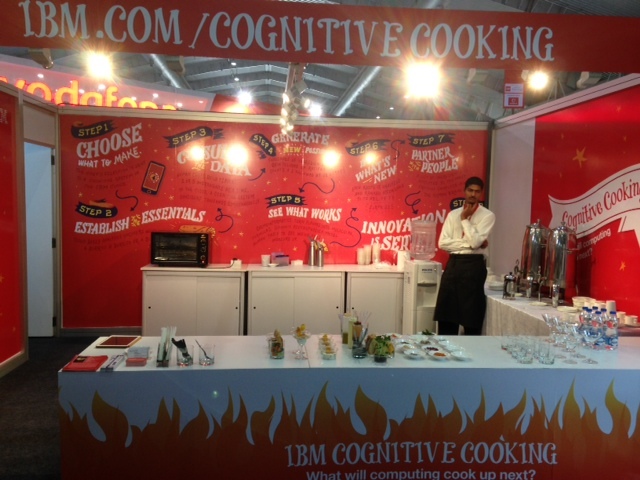 I had been invited by IBM to showcase Cognitive Cooking and the web based Chef Watson App. This app, created through collaboration between IBM and Bon Appetit, has been designed to meet the challenge that most people face — of discovering delightful new recipes or simply deciding what to make for dinner with the ingredients they have at home. Chef Watson is a first-ever cognitive cooking beta app, a web-based app that is powered by IBM Watson technology and Bon Appetit’s culinary expertise and about 9,000 recipes, enabling users to design and cook recipes they might never have thought of. 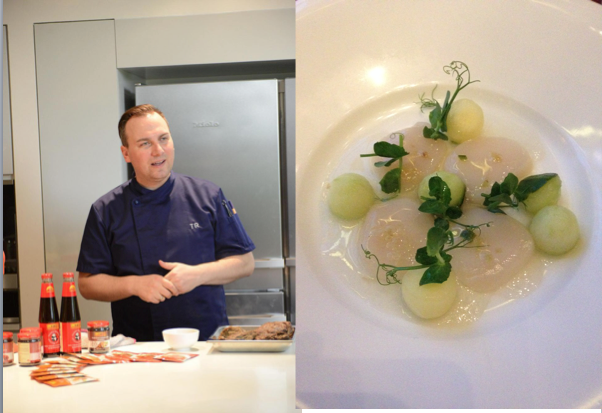 At CeBIT, the aim was to bring together Chef Watson and the expertise of a chef. 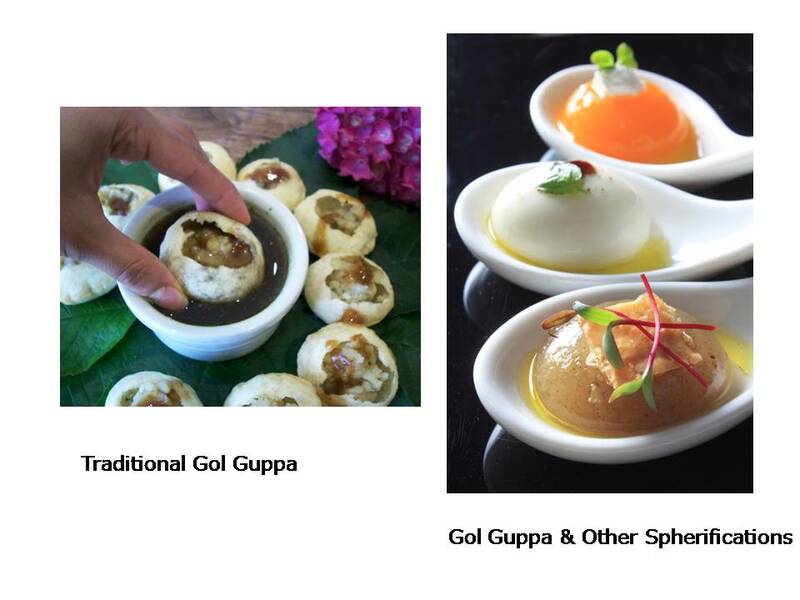 At the event, I selected 5 recipes created by Watson, modified them to suit Indian tastes and preferences and served them in mono portions. 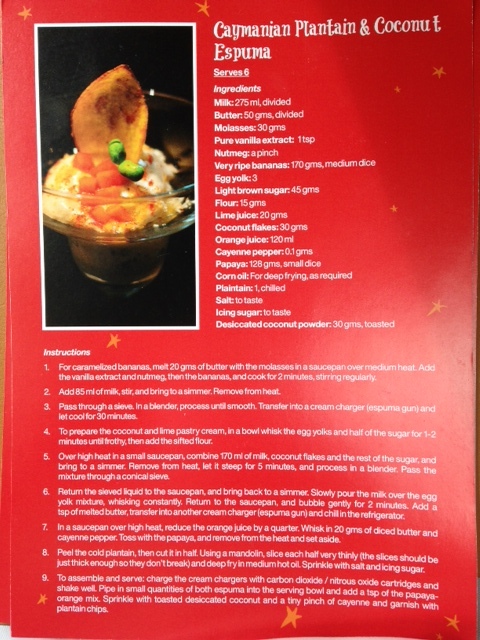 The dishes includes Turkish Style Bruschetta; Swiss-Thai Asparagus Quiche; Vietnamese Chicken and Apple Kebab; Caribbean-Style Chicken and Chips; Coconut and Plantain Espuma. The reactions of the crowd I must say was overwhelming and cognitive cooking became the most talked about activity at the event. For the Special lunch attended by 120 CXOs of various companies we also served a duet of chocolate for dessert — Italian Chocolate Cake using Chef Watson’s recipe and Cryo Chocolate Ganache Powder with Saffron Soil & Mint Soil created by me. 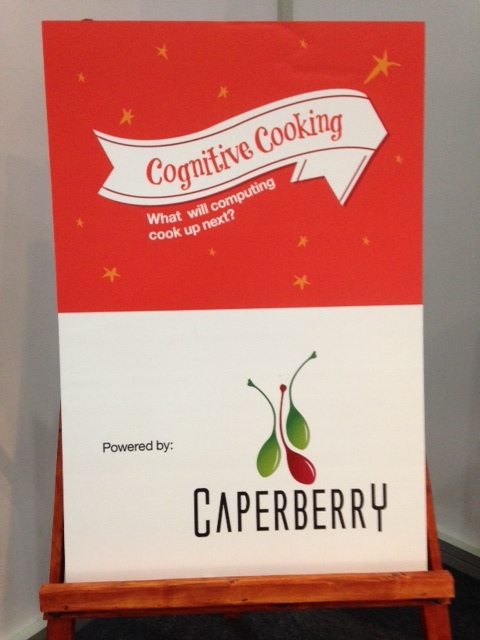 This app is ‘cognitive’ because Watson can reason about flavour the same way a human use their palate. The system understands natural language, reading and analyzing tens of thousands of existing recipes to learn about ingredient pairings, dish composition, and cooking steps. It then cross references these with data on the flavour compounds found in ingredients, and the psychology of people’s likes and dislikes to model how the human palate might respond to different combinations of flavours. 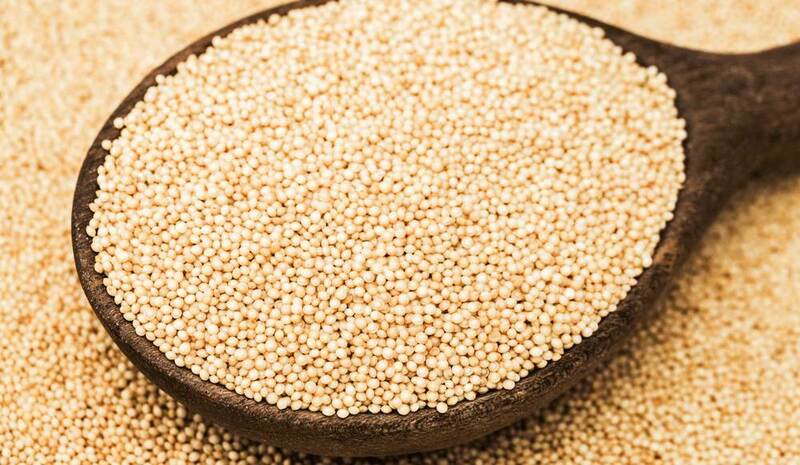 The ingredients it selects are based on what it has learned might pair well based on the recipes it has read, as well as what it knows about the underlying food chemistry – specifically the flavour compounds of each ingredient. There are a huge number of possible combinations and Watson generates thousands that it thinks will work well, sorts them, and then presents the user with 100 options. For me, it was an engaging opportunity to see technology play a role in creating new dishes and imagine the possibilities ahead. We live and cook in interesting times to be sure. ‘Getting better with age, like wine’, they say. The magic, of course, lies not so much in the ageing, but in the wine itself. Only fine wines age elegantly. The very best can reveal their pleasures even after a 100 years in the bottle. At Saha & Buyan Restaurants in Singapore we have the privilege of stocking and displaying a spectacular collection of old vintage wines. 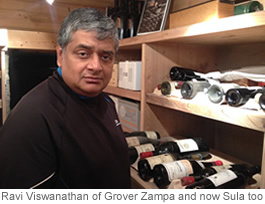 This is called the Museum Collection and comes from the private collection of wine connoisseur and collector of Ravi Viswanathan, who also happens to be the investor behind Saha & Buyan. The Museum Collection is an apt name, for these bottles are treasures, created over centuries. There is the 1811 Juglar Champagne, from cellars that received a gold medal by Napoleon for the beauty and richness of their wines. 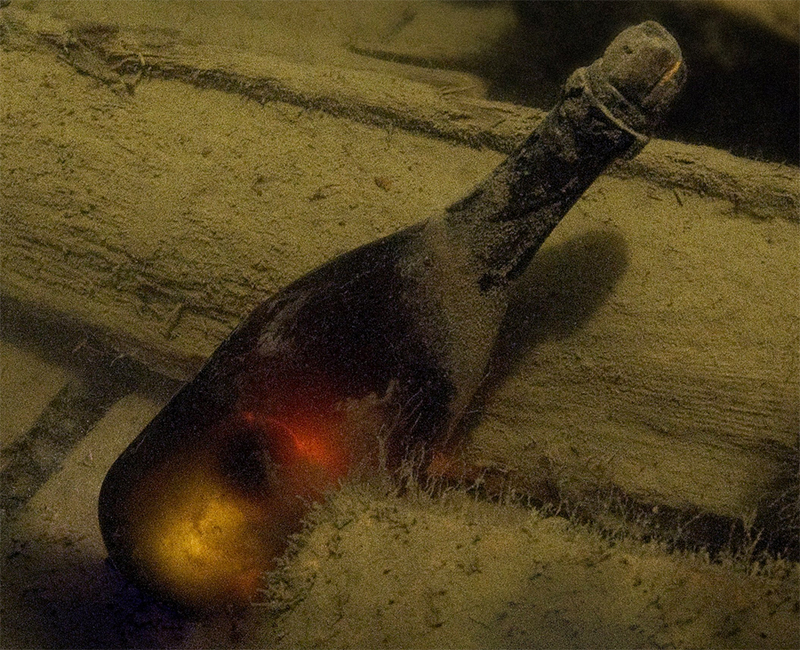 Divers exploring a shipwreck in the Baltic Sea discovered these bottles in 2010. More recent vintages of Veuve Clicquot are a popular celebratory pop these days. But imagine a bottle of this Champagne from 1841, made during the time of Madame Clicquot herself. It is widely acknowledged that this house made some of best Champagne under the management of this highly respected winemaker. 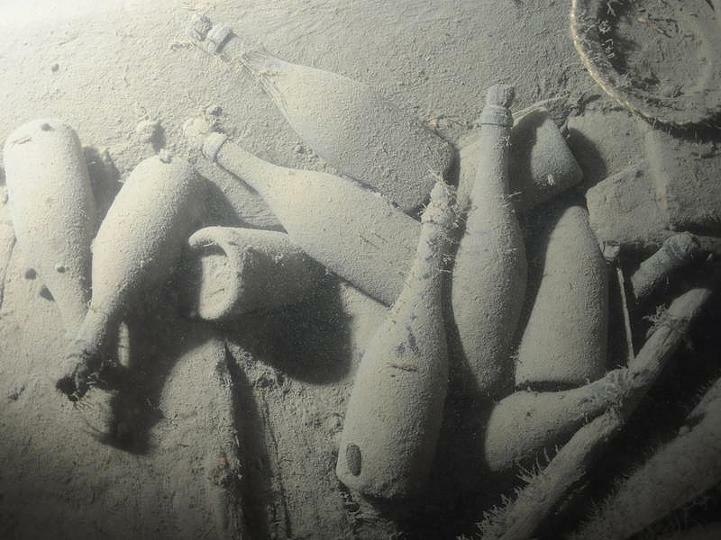 Naturally, Champagne aficionados were thrilled when 162 vintage bottles – 79 of them drinkable – were discovered in a shipwreck in the Baltic Sea some 170 years after they were bottled. If you wish to drink what Tsar Nicholas II would have, there’s the Heidsieck Monopole Co 1907. It was found in a shipwreck of a Swedish freighter in the Gulf of Finland. The ship was specially commissioned to deliver wines to the Tsar in 1916, but a German submarine hit the ship and it sank with all the 2000 bottles of wine. They were found in 2000. For another sip of history there’s the 1821Vin Jaune from the Chateau Chalon, Jura, France. 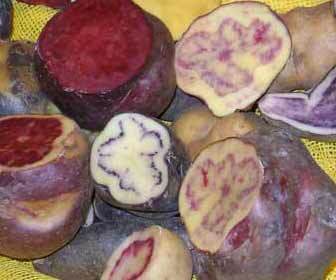 It is known for its nutty flavors and aromas that can develop additional curry notes as the wines ages due to presence of sotolon. 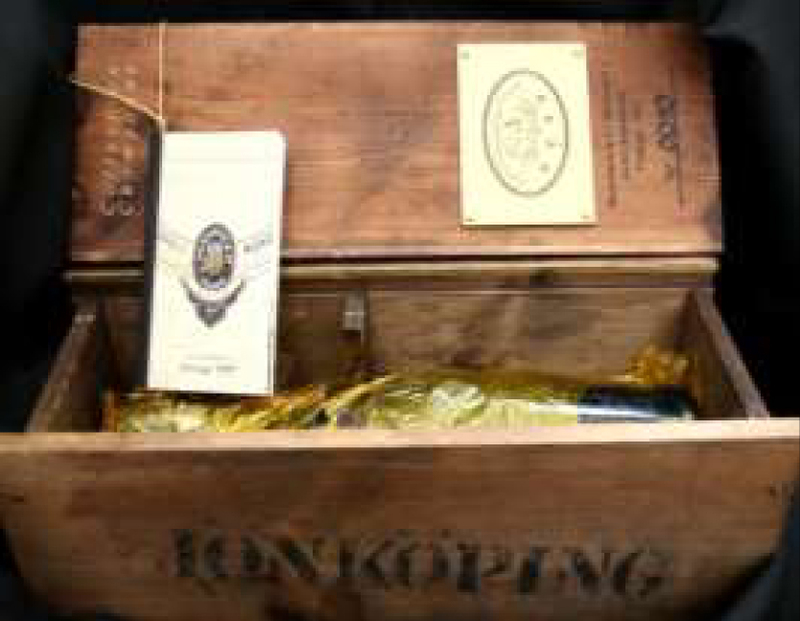 The wine’s yellow colour ranges from pale to deep gold and also gives it its name. Probably the oldest aged white wine in the world, it fetches great prices at auctions. The1821 vintage also has sentimental value for it is the year when Napoleon, exiled in the island of St Helena, passed away. 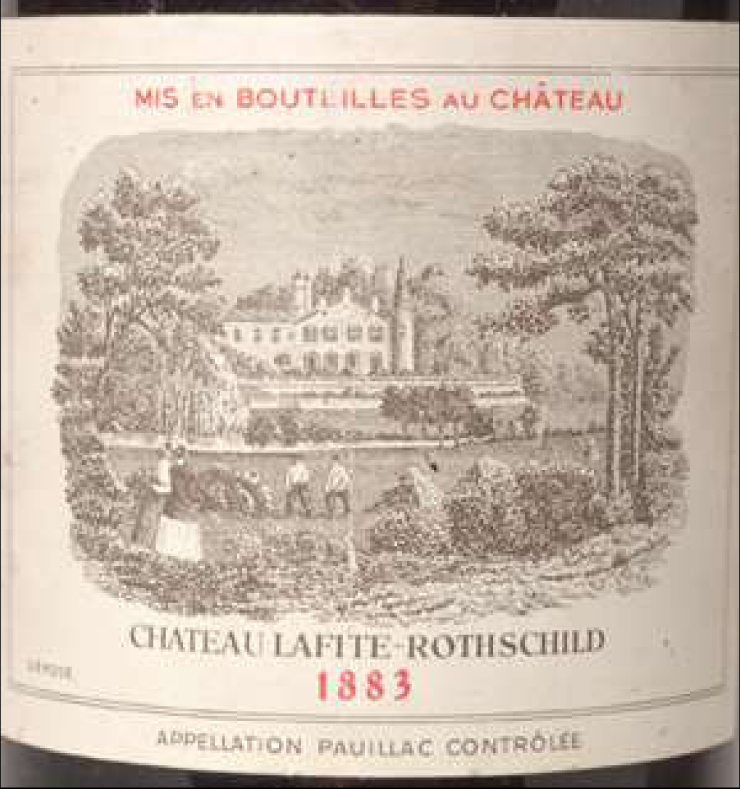 The Museum Collection includes two splendid old vintages from the Chateau Lafite Rothschild. There’s the 1854 and the 1883, the very best examples of old Bordeaux wines. Structured, rich and grand, these last for 100 years and more. 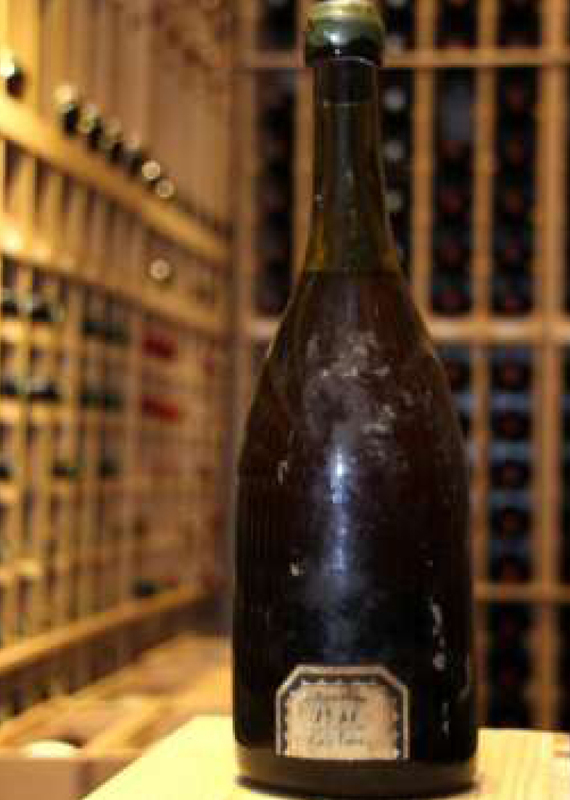 Another great Bordeaux wine in the Museum Collection is the Mouton Rothschild 1874. A magnificent wine, it is guaranteed to transport the drinker into a magical land of flowers and beautiful scenery. From Chateau Margaux, one of the five 1st Growth wines from the 1855 Classification of Medoc wines, there are 1877 & 1896 vintages. Feminine, elegant and velvety, this one is like the woman with inner beauty, ageing gracefully for over a century. 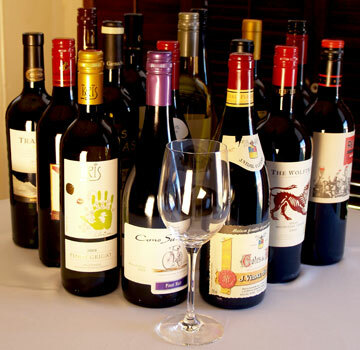 Although some of these wines are not for sale, there is an excellent collection of vintage wines, ranging from 25 to 75 years old, that you can savour with your next meal at Buyan or Saha. 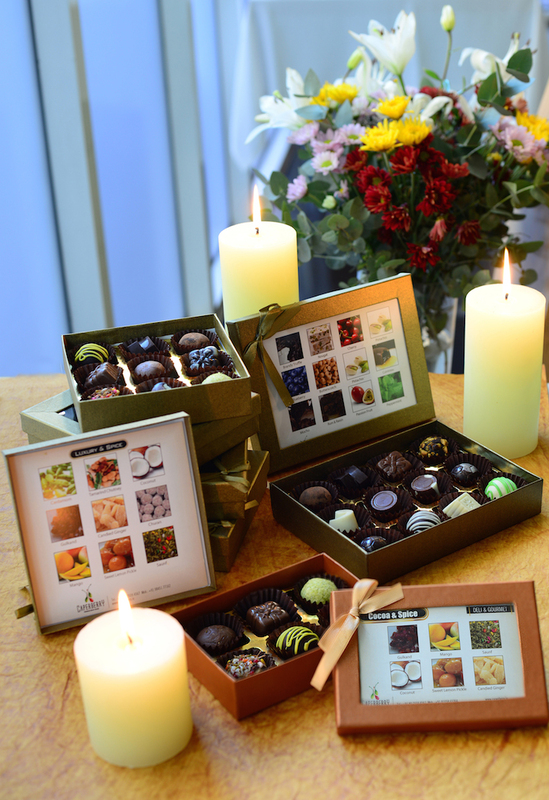 We’re taking a breather after packing off the Caperberry chocolate orders that kept us busy through the Diwali season. 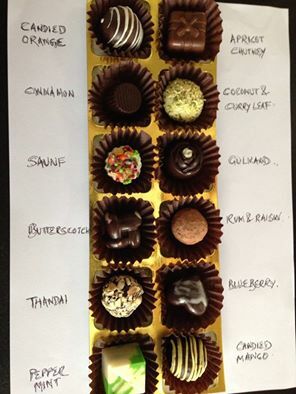 Even as the luscious-centred delights were being crafted and placed in their luxury boxes, I found myself thinking about our endless fascination with chocolate, the perfect gift and a sensory pleasure like few others. How it all began: The history of chocolate goes all the way back to the Mayans. 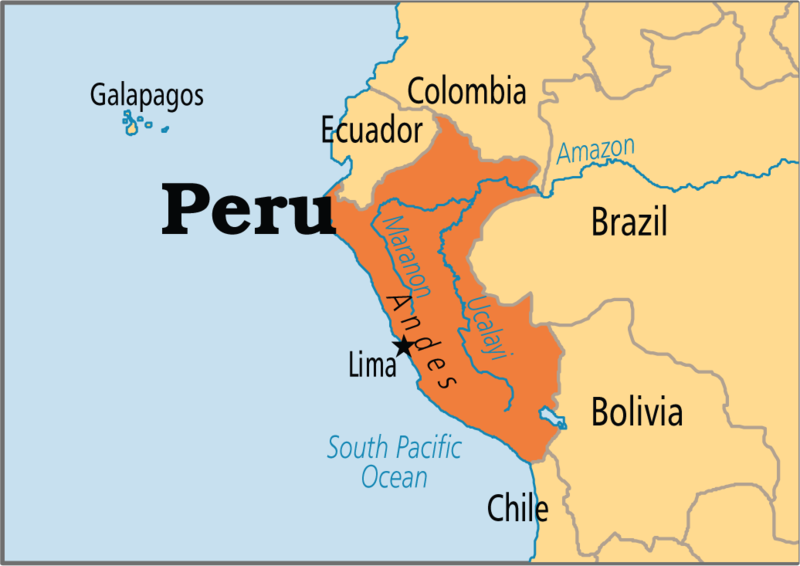 Cacao beans were so valuable to them that they were used as currency. In 1519, the Aztec emperor Montezuma served some to his guest, the conquistador Hernando Cortes. Cortes took cacao back home to Spain in 1529, sweetening the cacao drink for Spaniards. As the drink gained popularity, the Spanish planted cacao trees in their colonies in Ecuador, Venezuela, Peru and Jamaica. Early experiments: Milk chocolate wasn’t invented until 1875. The first European chocolate involved removing half of the cocoa butter, crushing what remained and mixing it with salts to counter the bitter taste, this was known as Dutch Cocoa. Milk chocolate was discovered by taking this powder and mixing it with sweetened condensed milk, which had been invented by a man named Nestle. Sounds familiar? As a gift: According to some historical versions, Anne of Austria, daughter of King Philip III of Spain, who married King Louis XIII of France in 1615, gave him chocolate as a wedding gift. That is also how news of chocolate spread from Spain to France and other parts of Europe. The food of love: Famed lovers Montezuma and Casanova had declared chocolate to be an aphrodisiac, and the Marquis de Sade was once arrested for hosting a ball where he spiked the chocolate pastilles with Spanish fly, turning the gala into an amorous affair. There’s no denying that chocolate gives most people the feeling that they’re in love. Apparently, that’s because of what phenyl ethylamine (PEA), a chemical in chocolate, does when it’s released in the human brain. A sensation: People desire chocolate for its sensory properties, its melting sensations and intense flavour, which develops in the cocoa solids during the fermentation process. 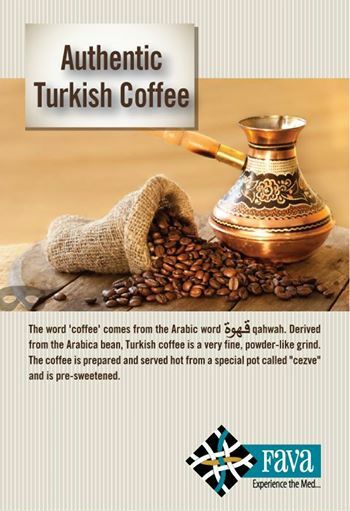 Its aroma and flavors are highly complex. More than 500 compounds responsible for aromas have been found in roasted cocoa beans, and chocolate has more 1,500 flavor compounds, which is three times the number found in wine. Too much demand: The world is facing a chocolate shortage due to the demand for chocolate increasing all the time. Supply is unable to keep up, making this unique and delightful ingredient dearer every passing day. So indulge in it before it becomes unaffordable ore ven worse, unavailable! I have been spending a fair amount of my time in Singapore of late, on account of my recent venture Saha- Signature Indian Restaurant, there. Primarily on Sundays when Saha is closed,I have the opportunity to explore the city, which has a well-deserved reputation for its gastronomy. 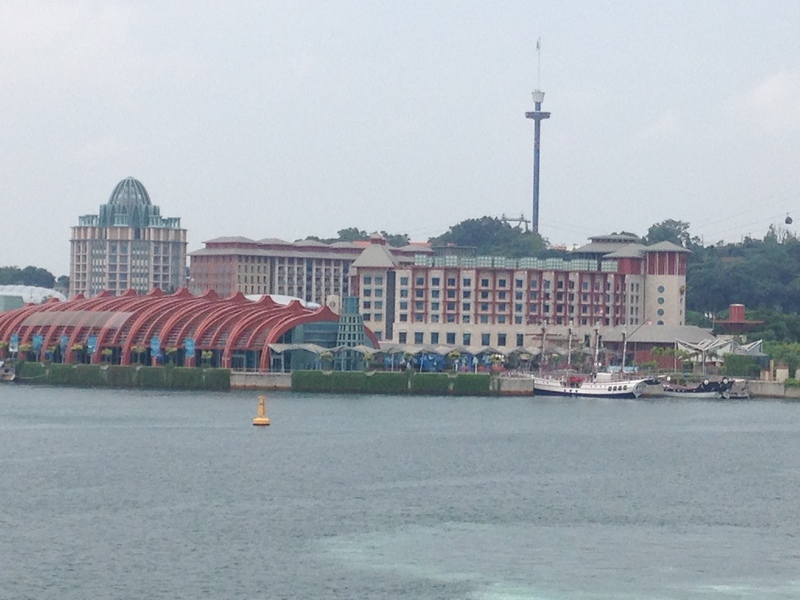 During my last trip in September, I decided to discover Sentosa, the playground of Singapore, if you will. The island resort, reached by a causeway, a tropical-themed boardwalk or a cable car ride which offers splendid views, is chockfull of attractions and things to do – from a Dolphin Lagoon and ocean-side pyrotechnics to luge rides and an adventure park. Much as I’d like the occasional adrenaline rush of a para jump, it’s the wine and dine options at Sentosa that have captured my interest the most. 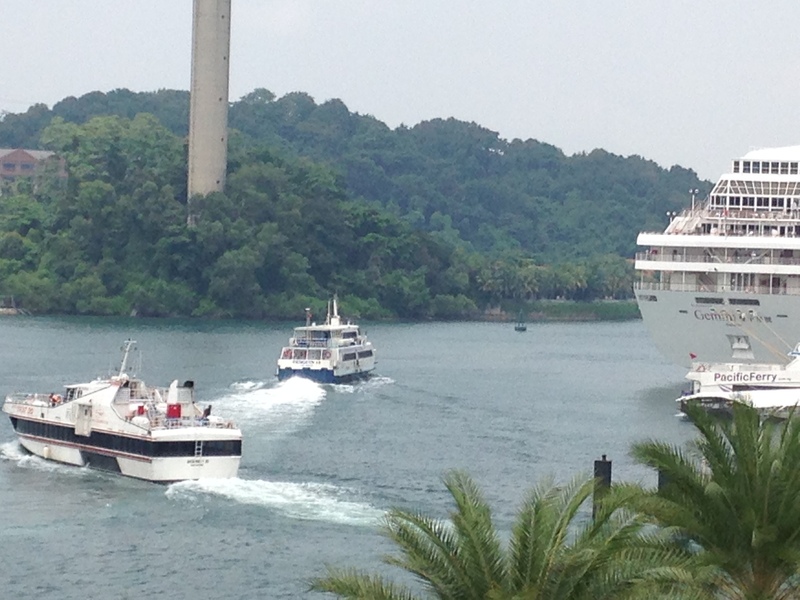 I began at Vivocity Mall, which is the hopping-off point for Sentosa. 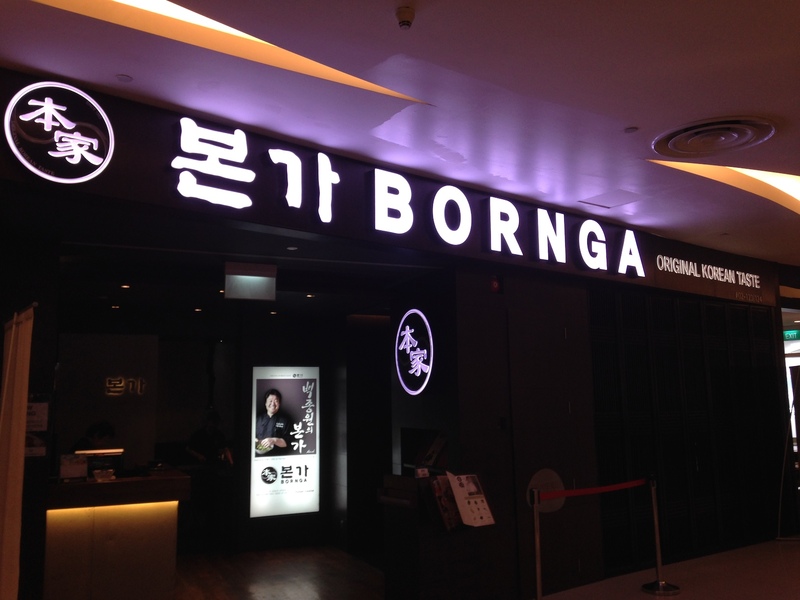 Besides the array of retail and entertainment options, it also houses some top-rated restaurants. 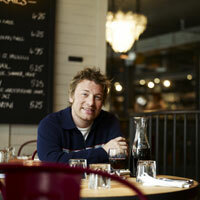 Among them is Jamie’s Italian by British chef Jamie Oliver. It’s known for its Antipasti Planks of assorted Fish, Meats or Vegetables; Fresh home made pastas like Shrimp Linguini, Truffle Tagliatelle; Wild Mushroom and Smoked Mozzarella risotto, Thirty day matured Prime Rib, Baked sustainable Halibut, and Tiramisu & Epic Brownie. Make sure to you book in advance, particularly for dinner to avoid disappointment. Other quality restaurants at Vivocity include Bornga, serving Korean-style barbecue, and Serenity Spanish Bar & Restaurant for very good paella and sangria, King Louis- Grill & Bar a medieval themed restaurant, The Queen and Mangosteen for British food, Madam Kwan’s for Malaysian Nasi Lemak, Tajimaya-.Japanese Charcoal Grill- and on to Sentosa, with its luxury resorts and restaurants that span the gamut from beach bars to cafes, bistros and fine dining places. Among the headline-grabbers in Sentosa CoveareSaint Pierre &Brussels Sprouts by celebrity Belgian Chef Emmanuel Stroobant. 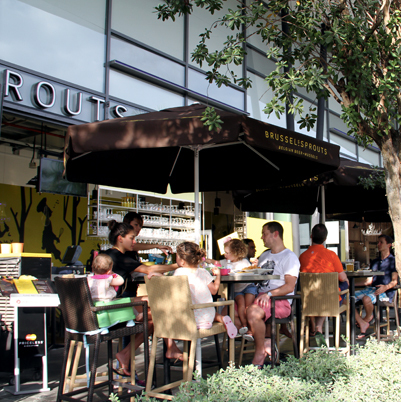 While Saint Pierre is known for it’s fine modern French cuisine, Brussel Sprouts serves Musses and a wide range of Belgian craft beers in a fun-casual atmosphere. The freshest and mussels are served in ten different styles – Vin Blanc (onion, parsley, butter, leek, celery,white wine), Fromage Bleu (blue cheese, bamboo shoot, mushroom, cream), Ostendaise (fish stock, lobster bisque, grey shrimp, mushroom) and more – with an endless supply of fries. I was impressed by the play of little local touches on a European classic. Then, there’s the Earl of Hindh, decorated with grand portraits of Maharajas, full-length mirrors and antique chandeliers. 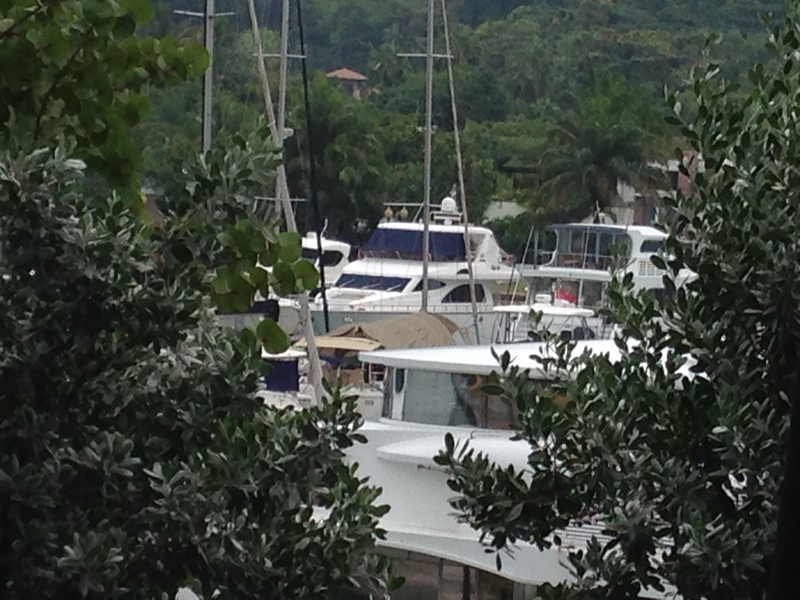 The view of the marina from the restaurant is simply breathtaking. 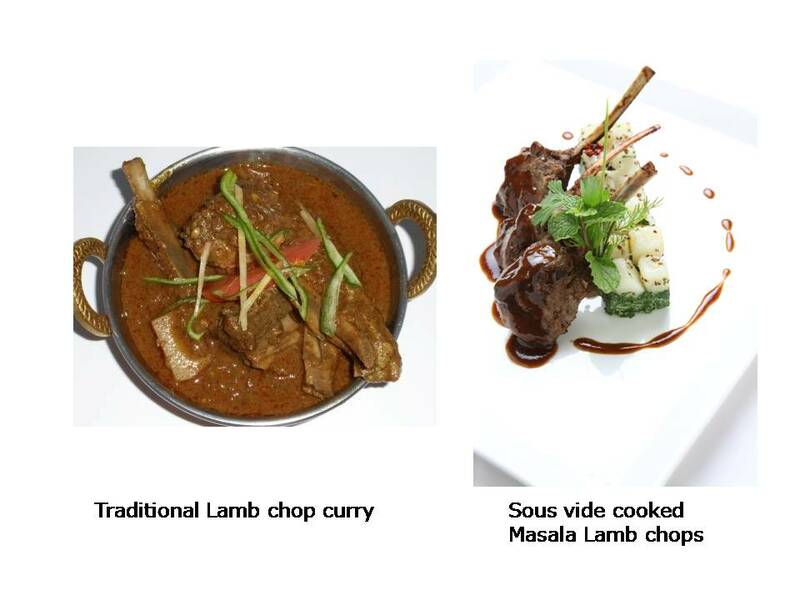 The menu is inspired by the Indian cuisine from the British Raj, when the maharajas and royalty dined on exotic dishes and hosted lavish feasts. 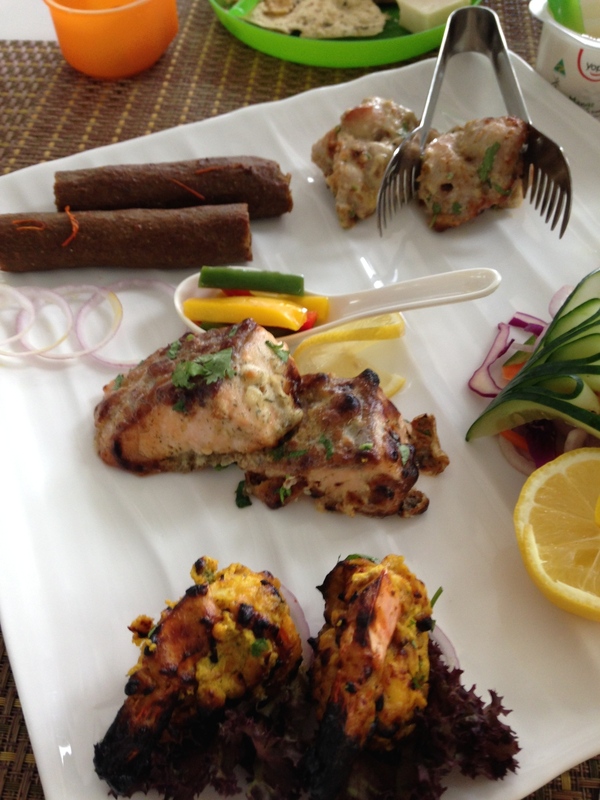 On the menu is a range of kebabs, with the perfectly-executed Kakori Kebab being a signature and curries such as Murgh Tikka Masala, now a global best-seller, besides desserts like Aam Tukda. 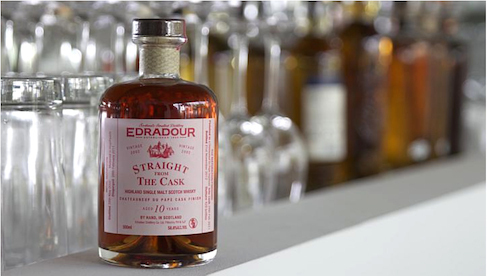 Earl of Hindh also stocksa fine selection of single malts and whiskies, to be paired with the rich dishes. What could be more Indian than that!